Meathead Movers is here to take care of the heavy lifting for you on your move to Richmond Movers. Our clean-cut student athlete movers are ready to get you safely settled into your new Richmond Movers home. If you are relocating to the San Francisco area and are looking for a community that has a little bit of everything, Richmond should be at the top of your list. This unique East Bay community features an inviting combination of commercial and residential areas and is sprinkled with several unique attractions that make the city stand out. 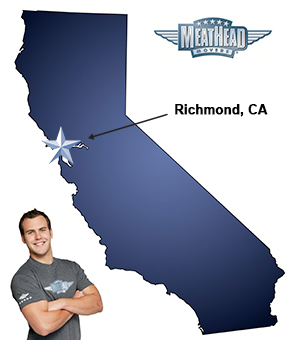 Meathead Movers are the Richmond movers to trust when relocating to this bustling city. Richmond has a population of just over 100,000 people, so there is always something going on. This western Contra Costa County community is made up of several distinct areas. From Marina Bay, which was once the site of the Richmond Shipyards and is now a multi-unit residential area, to Point Richmond, which is a village within the city itself, Richmond has the perfect home for you. After settling in to Richmond, you’re sure to enjoy exploring your new city. Point Richmond, nicknamed The Point, is a favorite among locals and is bursting with small-town charm. The Point Richmond Music Festival takes place there each summer and consists of free concerts that take place on the first Friday of every month. From the eclectic array of stores at Hilltop Mall to the wonderful performances at the Masquers Playhouse, Richmond has a lot to offer. Getting settled into your exciting new life in Richmond is easy when you hire quality Richmond movers. By hiring Meathead Movers for your move to Richmond, you can ditch crews of sketchy movers for a team of clean-cut student athletes. Our movers are drug and smoke-free, and receive extensive training. At Meathead Movers, we also offer a distinctive moving concierge service which allows you to take care of business with ease. We can connect you with real estate attorneys, storage units, handymen, babysitters, and just about anything else you could need. We also provide reliable packing, storage, on-site relocations, and commercial moves. With those stresses out of the way, you’ll quickly be able to visit the harbor seals that live on the Castro Rocks or enjoy a picnic at Keller Beach, where you’ll experience views of the San Francisco skyline and the Golden Gate Bridge. We are so confident in our services that we even offer a 100% satisfaction guarantee! So what do you have to lose? Contact Meathead Movers today for a free moving quote and learn how we can help you on your next move! Moving to Richmond? Here are some helpful resources. Very personable, trained, conscientious. I hope that you will credi my account for the one hour unpacking. I am still waiting for an answer to resolve the broken antique table that occurred during our move. Hoping that credit can be competed in a timely manner as well. Pricing was competitive. Your Customer Service people went above-and-beyond-the-call-of-duty to be flexible and helpful when scheduling the move. The crews attitude and proficient work habits exceeded my expectations; all were personable and made the move much less stressful than I anticipated! They were great! This is actually my 3rd team of Meathead Movers making the final leg of my journey and all three teams were great to work with. They are cautious, caring, STRONG, and willing to help, yet efficient and and waste no time getting the job done!